In the mean time, most PLC manufacturers have found ways to make the programmers life easier by introducing User Defined Types or UDTs. The name says it all; it is a â€˜typeâ€™ that you, the programmer, can define all by yourself. This means that your programming environment will not only have the regular integers (INT) and Booleans (BOOL), but could also have a â€˜VALVEâ€™ type or a â€˜MOTORâ€™ type. I canâ€™t speak for other brands of PLCâ€™s, but the Allen Bradley ControlLogix series of PLCâ€™s, together with RSLogix 5000 programming software, makes it very easy to work with these UDTs, and since the introduction of RSLogix version 17 earlier this year, it is now even possible to edit your UDTs while online with a running system. The Controller Organizer has a folder called Data Types > User-Defined with all the UDTs in the project. 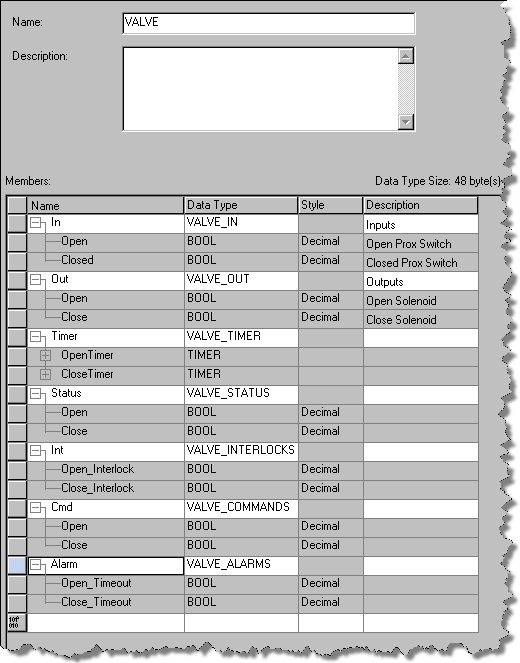 I am of the opinion that every PLC program should rely heavily on UDTs to improve readability, and if you are an OOP adept, it can be a great help to organize your classes. Objects: An object is an instance (occurrence) of a class. In our example, there could be a Valve_001 and a Valve_002, which are both instances of the class â€˜VALVEâ€™, with the same attributes and methods. Of course the definition of OOP goes a lot further than this. There is a very understandable explanation here: http://en.wikipedia.org/wiki/Object-oriented_programming#Fundamental_concepts for those who would like to read more. For now, letâ€™s leave it at this, and see how we can apply this to an industrial environment. It has inputs and outputs that are specific for the object (proximity switches and solenoids). You can tell it to go â€˜openâ€™ or â€˜closeâ€™. 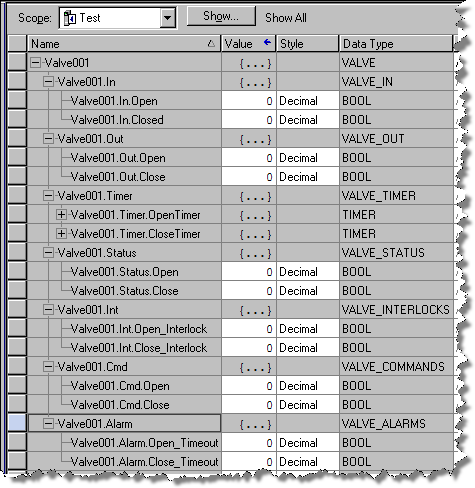 It could have an alarm timer, that would tell us if the valve did not open or close in a given time period after a command. It might have interlocks, which allow the valve to open or close under certain conditions. A UDT for this class, would fit all these properties and methods in one simple type. But, as always, we can expect further complications of the class â€˜VALVEâ€™ during the realization of a project. To be as flexible as possible, I highly recommend the practice of nesting UDTâ€™s, which will become clear along the way. Letâ€™s start with defining our class, and keep in mind that it will have to be easily accessible for maintenance people or other programmers. If we start at the I/O end, the best method is to create sub-classes called VALVE_IN and VALVE_OUT, which will contain our I/O. The following example uses RSLogix5000 V16. First, create the sub-classes. From the File menu select New Component > Tag. The following dialog box appears to create and edit the members of the UDT. As you see, the class VALVE now consists of the sub-classes VALVE_IN, VALVE_OUT, VALVE_TIMER, VALVE_STATUS, etc. While adding stuff to my class, I did not have to re-create the object Valve001. RSLogix updated it for me, so all the properties and methods are available in my program. Of course, you would still have to write code to tell your program what to do with that information, but that is also the reason why PLC programmers still have a job. For somebody that is not familiar with your program, it might be confusing to look at all your UDTâ€™s. We just made eight UDTâ€™s for one simple valve class! But remember, you only have to do this during the design phase. Once you have a solid design for all your classes (and made sure their names are self-explanatory), you will never have to look at your UDT folder again, and creating a new instance will be a breeze. Submitted by abdullah (not verified) on Wed, 2011-09-14 00:59. Submitted by Brad (not verified) on Wed, 2011-09-14 15:31. Can a member of a UDT alias another value? I've not been able to find a straightforward way of doing this. 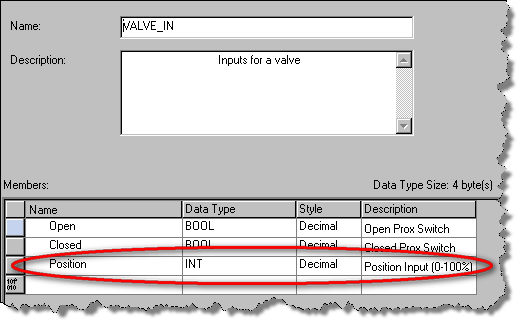 How do you go about 'attaching' the Local:4:I.Data.3 tag that stores the status 'VALVE_OPEN' to the 'VALVE_OPEN' member of the UDT? Submitted by Anonymous (not verified) on Wed, 2012-04-18 03:56. I've been struggling to alias a UDT with Inputs/Outputs from a devicenet scanner module(DINT). Finding an instruction that allows me to copy from these inputs/outputs to a tag with a UDT datatype appears impossible. If you've found a way to do it please help. Submitted by Coowallsky (not verified) on Fri, 2011-12-16 11:43. 8 UDT's for a simple Valve object? That kind of granularity is going to lead to major headaches for versioning, troubleshooting and just keeping house. Submitted by Srinivas (not verified) on Tue, 2012-06-19 10:17. Submitted by ngovankhoi on Fri, 2012-12-14 06:39. 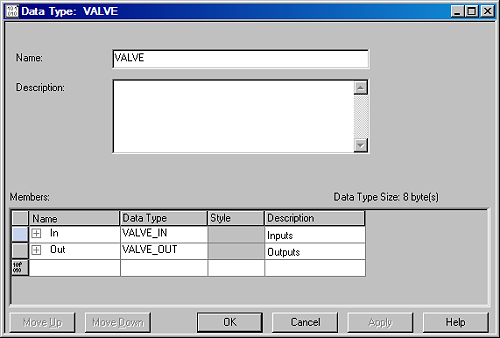 Could you please send me example to create UDT of Valve in step by step?